Margaret Thatcher was a hugely divisive figure in British politics. Her right wing politics saw Thatcher align herself with some of the most repressive and undemocratic regimes in the late 20th century - including apartheid South Africa and Chile’s Pinochet. Her description of the ANC and Mandela as terrorists was evidence of her ultra conservative view of the world. She championed the deregulation of the financial institutions, cuts in public services and was vehemently anti-trade union. She set out to crush the trade union movement. The confrontation with the miners and the brutality of the British police was played out on television screens night after night for months. The current crisis in the banking institutions and the economic recession owe much to these policies. And she went to war in the Malvinas. But for the people of Ireland, and especially the north, the Thatcher years were among some of the worst of the conflict. For longer than any other British Prime Minister her policy decisions entrenched sectarian divisions, handed draconian military powers over to the securocrats, and subverted basic human rights. Thatcher refused to recognise the right of citizens to vote for representatives of their choice. She famously changed the law after Bobby Sands was elected in Fermanagh South Tyrone. And when I and several other Sinn Féin leaders were elected to the Assembly in 1982 we were barred from entry to Britain. Margaret Thatcher’s government defended structured political and religious discrimination and political vetting in the north, legislated for political censorship and institutionalised to a greater extent than ever before collusion between British state forces and unionist death squads. It under her leadership that in 1982 that the Force Research Unit (FRU) was established as a unit within the British Army Intelligence Corps. This British Army agency recruited agents who were then used to kill citizens. Among them was loyalist Brian Nelson. He was a former British soldier and member of the Ulster Defence Association who was recruited by FRU in 1983. He became the UDA’s Senior Intelligence Officer and his associates in FRU helped him to update his intelligence files, including photo-montages of potential victims. In the summer of 1985 Nelson travelled to South Africa where he helped negotiate a deal for that ultimately saw the UDA, UVF and Ulster Resistance acquire 200 AK47 automatic rifles, 90 Browning pistols, 500 fragmentation grenades, ammunition and 12 RPG rocket launchers. The shipment arrived in the north in late 1987 or early 1988. The Thatcher government was across all the details of this shipment. Its impact on the streets of the north is evident in the statistics of death. In the three years prior to receiving this weapons shipment the loyalist death squads killed 34 people. In the three years after the shipment they killed 224 and wounded countless scores more. The extent of the role of FRU in the killing of citizens is formidable. But it was the killing of human rights lawyer Pat Finucane in February 1989 that reveals the depth of the structured state collusion policy being pursued by the Thatcher government. Pat was one of several lawyers targeted by unionist death squads at the behest of the RUC and British intelligence agencies. At every level of his killing British agents and agencies had a hand. The leader of the UDA group which carried out the killing was a Special Branch agent - Tommy Lyttle. The man who subsequently confessed to being the UDA gunman who killed Pat Finucane was Ken Barrett, also a Special Branch agent. The UDA man who supplied the gun was William Stobie, a Special Branch agent - later killed in 2001 by the UDA when he threatened to lift the lid on the Finucane case. And, of course, the man who provided the intelligence for the killing was Brian Nelson, a British army agent. This is part of the Thatcher legacy in Ireland. She will be especially remembered by many for her shameful role during the epic hunger strikes of 1980 and 81. 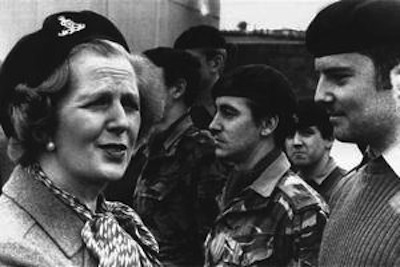 The Thatcher government believed that the criminalisation of the republican prisoners would break the republican struggle. It was not interested in a resolution. The events of that awful summer of ‘81 polarised Irish society, north and south. It was a watershed moment in Irish politics. The Thatcher government policy during the 1980’s was little more than a war policy. All of the strategies issuing from that policy were aimed at defeating or isolating republicanism. This included the shallow and ineffectual 1985 Anglo-Irish Agreement which was about creating a political alliance involving the Dublin establishment, the SDLP, and the British to defeat Irish republicanism. Margaret Thatcher was a prime mover in all of this. Shoot-to-kill actions by British forces also significantly increased. This was most evident in the shooting dead of three unarmed IRA activists in Gibraltar in March 1988. It is my view that Thatcher authorised the killings at Gibraltar. Later when the BBC and the IBA scheduled two programmes about Gibraltar Thatcher tried to stop them. She was “outraged” when the programmes went ahead. Later that year she introduced the Broadcasting Ban on Sinn Féin. Two years later Thatcher authorised the then British Secretary of State Peter Brooke to reopen the back-channel with republicans. We were wary of this. However, for almost a decade Sinn Féin had been patently trying to build a peace process and unfolding events on the world stage, including the dismantling of the Berlin Wall and the reunification of Germany, and the release of Mandela, were evidence that governments, and apparently intractable situations, could change. So we agreed to reactivate the back channel. But for Thatcher it all ended in November 1990 when she was forced to resign by her party who perceived her to be no longer an electoral asset. She was evicted from Downing Street with all the ruthlessness, treachery and warped humanity of what passes for high politics. Thatcher’s 12 years of dictating British policy in Ireland was a legacy of bitterness and entrenched division. Her Irish policy failed miserably.